Our long-standing reputation for safety is one of the most often-stated reasons for using The Outward Bound Trust. We are referenced in our sector as the most experienced in our field. We pride ourselves on this and take our responsibilities seriously. Parents, young people, governors, head teachers, businesses and specialist advisors all demand the highest standards of safety and we recognise the importance of this. Below you will find information on specific aspects of how we manage our health and safety and downloadable documents relevant to our courses. The overall and final responsibility for health and safety lies with the Trustees, The Trust’s Chief Executive taking day to day responsibility. The management of safety and risk in the outdoors ultimately involves the judgement of staff and this is supported through documentation and formal/informal meetings and discussions. Staff are required to keep up to date, understand, participate in and follow specified systems and rules. Handbook of Child Protection and Social Behaviour. All our instructors when recruited, have to meet our minimum outdoor qualifications and appropriate experience requirement, which includes, Summer Mountain Leader Award, Single Pitch Climbing Award and BCU Kayak/Canoe Coaching and Technical qualifications. Many have achieved higher outdoor technical qualifications such as Winter Mountain Leader Award or higher level BCU awards. Not only do our instructors have technical outdoor skills but they also undergo training in the facilitation of our courses and many hold a degree in Outdoor Studies, teaching or coaching qualification. In addition to a variety of National Governing Body qualifications and they all hold current First Aid qualifications. Group instructors and trainers work 1:12 for the duration of the course and where required for the activity 1:6. Before staff can drive mini buses, they must hold relevant licenses, approved by centre management and undergo ongoing driver awareness training. Instructors are expected to maintain or increase their qualifications, competence, levels of responsibility and positive influence. The Continuous Professional Development of instructors is key to enhancing the quality of delivery of our courses and all instructors have dedicated training days allocated to them across the year, to achieve their next CPD goal. Senior management spend time in the field with every instructor. All instructors undergo regular Safeguarding Training and enhanced DBS checks before working with groups. At The Outward Bound Trust we aspire to provide genuinely adventurous activities which have an element of real risk. The Trust can only do this by having robust systems of safety and risk management. Each activity, whether land or water based, has been reviewed by operational staff, significant risks and hazards are identified together with action required and control measures for their mitigation. The Risk Assessments are reviewed on an ongoing basis. Current legislation, regulation and good practice within the sector. We have 24hr pastoral care in all our centres. Instructors are responsible for delivering the programme, meeting course outcomes and for the welfare and personal development needs of participants in their groups. The Trust also has Duty Instructional night staff, who start work at 5:00pm each evening and work through until 9:00am the next morning. They assist with the general running of the centre during this time and are available to help course participants and visiting staff. All staff are First Aid trained. All staff and visitors are issued with ID, which must be worn at all times. 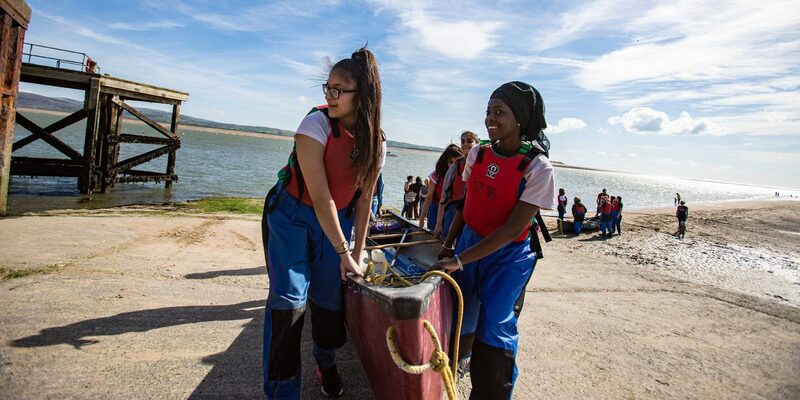 The Council for Learning Outside the Classroom is the managing and overall awarding body for the LOtC Quality Badge, which recognises providers offering good quality LOtC and managing risk effectively. All of The Trust's centres which accommodate school parties, have been awarded this standard of recognition. The Trust is registered and holds current licences for all its centres with The Adventure Activities Licensing Authority (AALA). Adventure activities licensing ensures that activity providers follow good safety management practices. The Trust is fully committed to the provision of a quality service in a manner that meets with the requirements and satisfaction of our supporters, clients and young people. Because of this, we maintain a Quality Management System in accordance with the international standard BS EN ISO 9001:2015 Quality Management Systems. For more information, please read The Trust's Quality Policy Statement. The Trust is a member of the Outward Bound International network and its saftey systems and is scrutinised and approved internationally. Regardless of their role, all staff have a duty to keep young people safe and to protect them from sexual, physical and emotional harm. All staff believe that The Trust should provide a positive, caring, safe environment which promotes the social, physical and moral development of the individual child or vulnerable adult. The Children Act 2004, The Protection of Children Act 1999 and the Safeguarding Vulnerable Groups Act 2006, all place a duty on organisations to safeguard and promote the well-being of children and young people. This includes the need to ensure that all adults who work with or on behalf of children and young people are competent, confident and safe to do so. It is important that everyone who works with children and young people understands that the nature of their work and the related responsibilities place them in a position of trust. The Trust has a detailed document that gives clear advice on appropriate and safe behaviours for everyone employed by and volunteering with The Outward Bound Trust. Each Outward Bound course is unique, taking participants on a journey of self-discovery. We need your support to change young peoples lives.